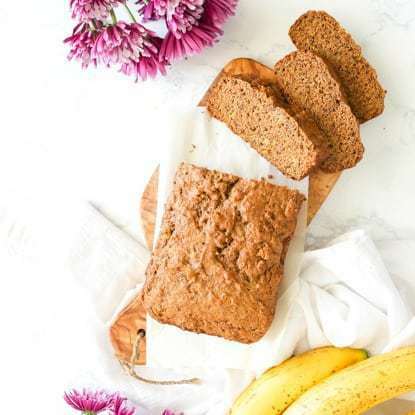 Vegan Banana Bread is an easy and delicious recipe that should be a staple in your healthy plant-based kitchen. 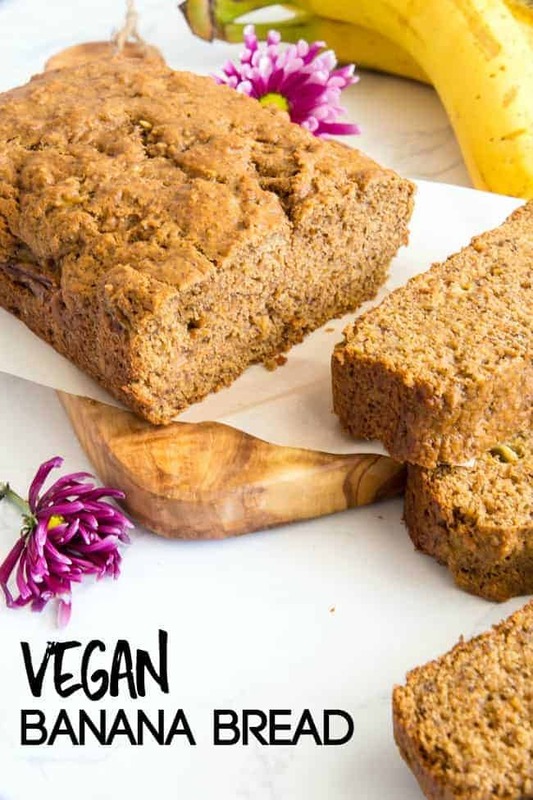 Vegan banana bread is not a difficult recipe. It’s not something that takes much skill in the kitchen at all. 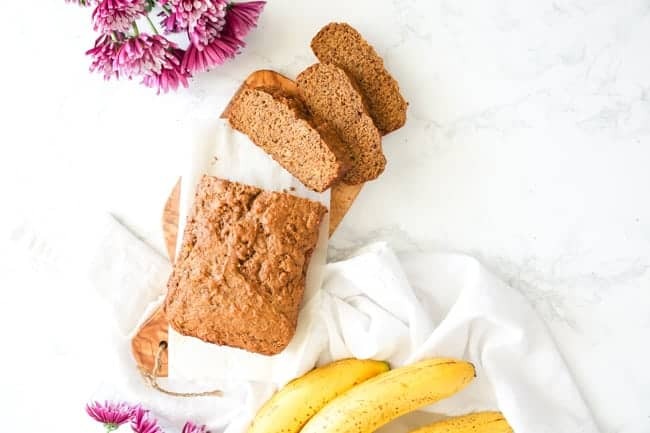 Anyone can make this banana bread come to life in just a few minutes of prep, a couple minutes more of stirring, and the patient waiting-game while it bakes in the oven. The hardest part of the whole recipe is that 30-35 minutes while it’s baking. Who am I kidding?? I hate bananas. Yes really – i hate them. That is, if they’re raw and by themselves in their natural form. It’s both a flavor and texture thing for me. Actually just thinking about it makes my stomach turn just a little bit. Bananas in a smoothie? I can do that. Bananas in a cake? Yes please! Banana pancakes? Served up on a tray in bed? Ok! 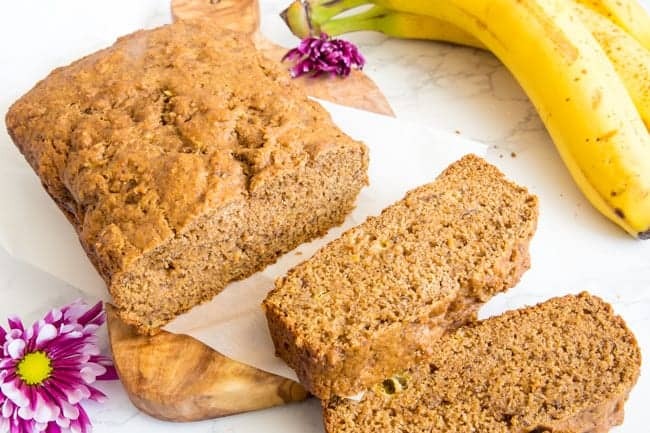 Bananas mashed up and baked into bread form?? Obviously. It is truly the strangest thing. I love banana bread. I love banana muffins. And these things have quite strong flavors of banana. But somehow I can handle it way way more than if it was a raw fresh banana. Hell, if I just get a chunk of banana left in my smoothie that didn’t get blended well enough, the smoothie is completely ruined to me. Hence, the reason why I require a high-powered Vitamix to blend up all my smoothies. 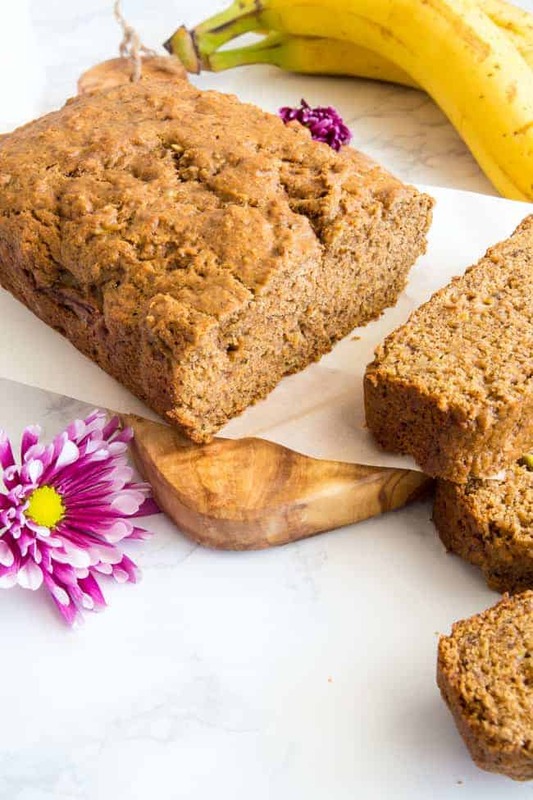 But let’s talk a minute about this vegan banana bread. I have a bit of nostalgia about banana bread. 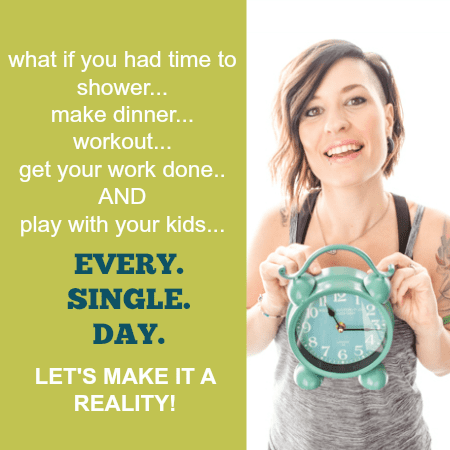 When my son was a toddler – that’s when I realized I enjoyed baking. I made banana bread almost every single week. We snacked on it. We had it with breakfast. I remember sitting at his mini picnic table and coloring with crayons in his big fat dimple-y toddler hand while munching on a thick slice of banana bread in the other fat hand. So this time around, about a decade later, I’ve given my classic banana bread an overhaul. A much-needed makeover. and the addition of whole wheat flour gives it just a kick of nutrition without sacrificing the flavor. In fact, when my wife gave this loaf a taste-test for me, she immediately gobbled it up. I asked her if it tasted healthy or whole wheat at all. She said she couldn’t even tell there was whole wheat flour in it. Let’s just say that within a day, wife and I were fighting for the last piece. A day! Between 2 people. It must be a good one then. How ripe should my bananas be for this Vegan Banana Bread? When I’m baking with bananas, they definitely need to be ripe enough to have released the sugars needed to sweeten whatever you’re baking. So there obviously needs to be some browning to your bananas. But how much? I would say the bananas are best when they’re quite brown. Not so brown that you’re unable to peel the banana because it’s too squishy. But definitely soft. And probably more spots than what you see here in the pics I’ve taken. But if that’s all you got, that’s all you got, and you can totally make that work. 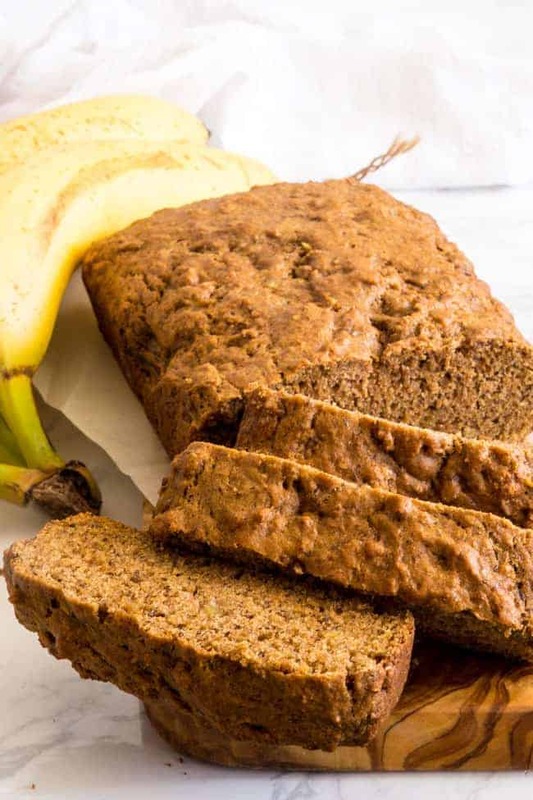 Get your banana bread on. Don’t get scared of the flax egg situation. In this vegan life, you’re gonna need to get comfy with a different kind of egg. Line a 9x5 loaf pan with parchment and set aside. Preheat oven to 350F. In a small bowl, combine the ground flax seed and water. Stir to mix and set aside for 5-10 minutes while it thickens up to about the consistency of an egg. Once "flax egg" is thickened, pour it into a large bowl along with the coconut sugar and maple syrup. Whisk until smooth. To the large bowl, add in the mashed ripe bananas, applesauce, melted coconut oil, and vanilla. Whisk well. In a small bowl, combine both flours, cinnamon, baking soda, baking powder, and salt. Add half of this dry mixture to the wet ingredients. Stir until just combined. Then add in remaining half of the dry ingredients and stir again until just combined. Pour into prepared loaf pan, smoothing out the top. Place in preheated oven for 30-35 minutes or until bread is golden and an inserted toothpick comes out clean. Wait at least 30 minutes before pulling bread out of pan to cool on a cooling rack. This sounds so delicious. We have banana trees in our yard and I am going to try this recipe.